It is that time again my friends! Halloween is upon us. Do Tranformers celebrate Halloween? Probably not, since they can transcan and transform, it’s like everyday is Halloween. 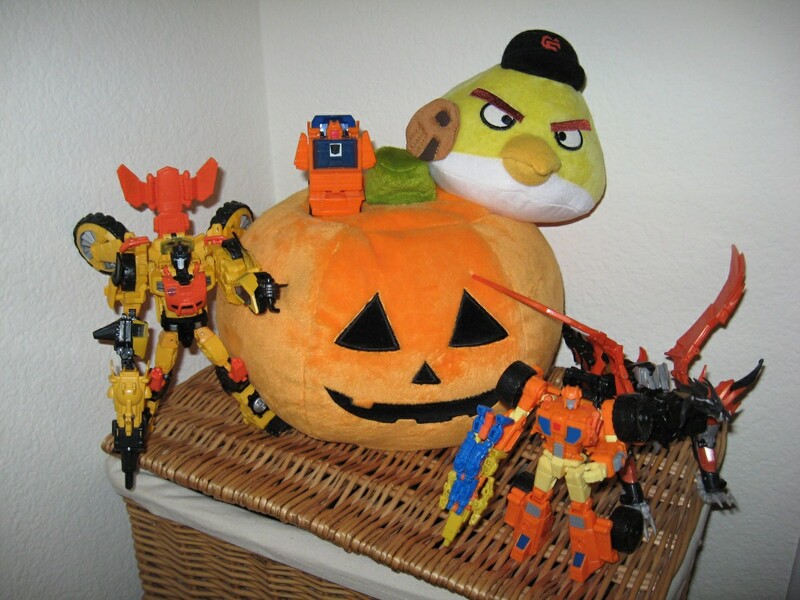 Here is another pic where I take my orange plush pumpkin with some orange Transformers. Click here for the 2012 version. Scroll to the bottom for the pic. Honestly, there just ain’t that many orange TFs. I tried to find some other than ones I already used in 2012. What you see in the pic is all I can come up with: Generations Scoop, Generations Sandstorm, G1 Wideload, and Prime Voyager Predaking. Some of these are even questionable as orange. Sandstorm is actually mostly yellow, but with enough orange bits. Predaking is probably about half orange and half black. And of course I gotta mention that the San Francisco Giants is once again world champs! The Angry Bird plush with the Giants cap is to help celebrate that fact. In the last 5 years, Giants win the whole thing every time on the even number years. So are they gonna be champs again in 2016? And it’s always so fitting they win it around Halloween. The Orange and Black is oh so fitting! Happy Halloween! Transform and Roll Out! The next Transformers TV show is Transformers: Robots in Disguise. If memory serves, Transformers Animated first came out in 2008, and Transformers Prime was released in late 2011. So a new show now follows this trend where Hasbro presents a TF reboot once every three or so years. The season 1 trailer appears below. At first glance the character designs look awfully close to TF Animated. Though looking at it closer, you also see hints of TF Prime. The appearance of Optimus and Bumblebee always seem to include a few designs from the immediate past. At this point, I don’t know if I like these designs. But I know I’ve said that about both TF Animated and TF Prime, and over time they kinda grew on me. Maybe I just need time to digest this new look. The animation style appears to be cel shading. So I guess the animators are using 3D models, but rendered to have a more cartoony look. Kind of a mix between 2D and 3D. This could work. Another example of a fusion between Animated (2D) and Prime (3D). Hasbro seems to be continuing the trend of having a small team for the Autobots, like in Animated and Prime. There’s Optimus, who acts like his usual Peter Cullen self. No surprises here. Then there’s Bumblebee. This Bee is back to being able to talk, which I like. The movie blips Bee never really did it for me. His characterization is also reminiscent of G1, but physically he appears tougher. Next in the group is Sideswipe (the red one). His persona reminds me of Hot Rod. I guess he’s the bad boy of the group. Strongarm is the tough and no non-sense fembot of the bunch. She acts like Arcee but has the looks of a female Wheeljack. The Dino muscle on the team is Grimlock, though his colors and behavior more closely resembles Bulkhead. Rounding out the team is Fixit, the small and spunky orange bot who appears to handle medic duties. I dunno, right now I feel like this cast is ripped straight out of a stock character manual. Hopefully I’ll find them more interesting once the show gets going. Of course with every new show, Hasbro will be making more toys. I’m not aware of any toy info at the moment, but you can bet your boron compressor they will be making their way to store shelves in 2015. Robots in Disguise… Transform and Roll Out! April has traditionally been a slow month as far as Transformers purchases go. This year was no exception. 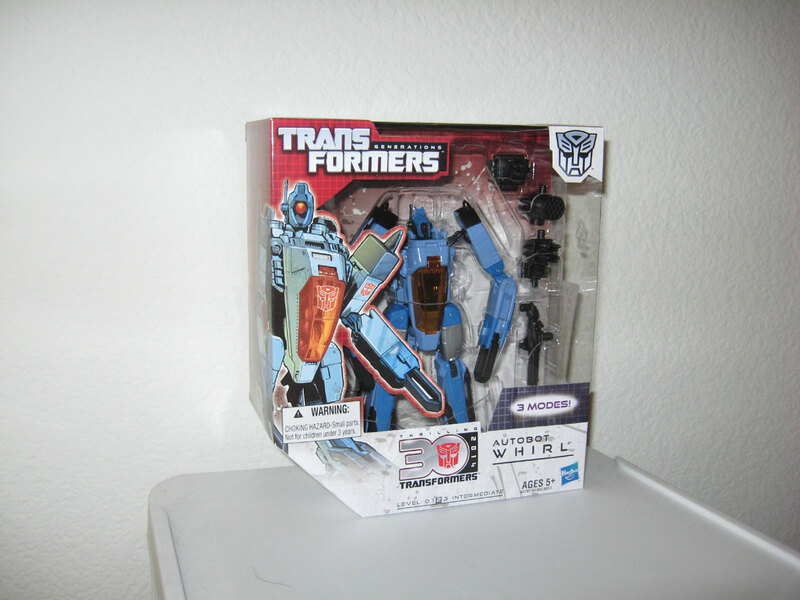 The only figure here that was found at retail was Whirl. I remember I was pretty excited when I saw him, since it has been some time since I saw any TF that I wanted in store. I didn’t know this before I bought it, but Whirl has a third mode. 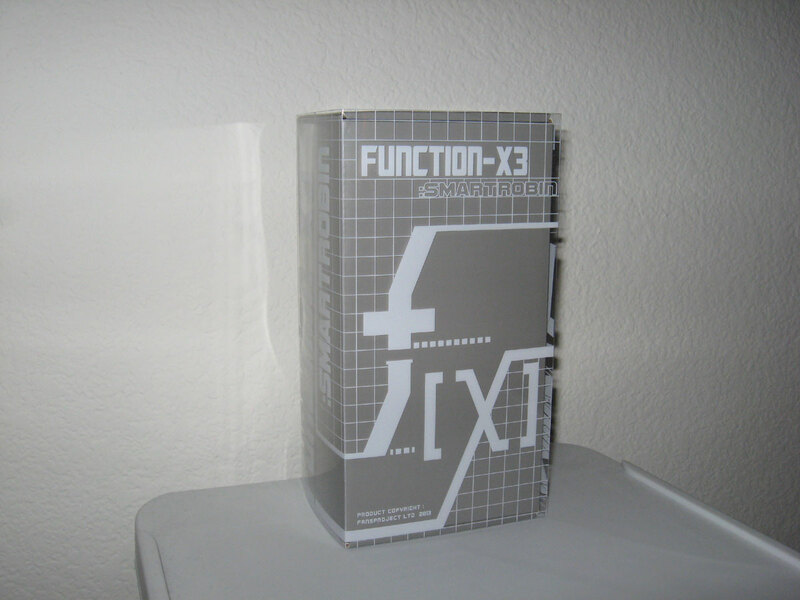 You would only know this if you looked at the instructions (or if you looked at the box carefully where it says 3 modes – duh). Hasbro calls this the Heloped Mode, which is a half-way mode between robot and helicopter, kinda like a GERWALK in Macross. I have not transformed the figure to this mode, since I really don’t see the point. Still, Whirl is a good figure. I like both the robot mode and the helicopter mode. And I’m glad that Hasbro is giving us all the Wreckers. Here’s to hoping they will someday make Broadside. Smart Robin is a FansProject homage to Brainstorm, a Headmaster from G1 Season 4. As of this writing, it is confirmed that Hasbro is making an official Voyager sized Brainstorm, set to be released in about a month. But back in April I don’t think anyone really knew this. I had a chance to play with Smart Robin last Dec, and back then I knew I had to have one. The transformation of this figure is ingenious. It’s hard to describe in words, but this figure utilizes some transformation mechanisms that are both clever and functional. The end result is a figure that looks good in both modes, and at the same time fun to play with. I would recommend this figure wholeheartedly if I didn’t know about the Hasbro figure that will come out soon, since the official Brainstorm will be larger, cheaper, and potentially awesome. Though at this point it’s hard to say if the Hasbro figure will be better than Smart Robin. I’ll reserve final judgement until I have the Hasbro Brainstorm. Oh, this is the first and only time I have used ToyArena. I was forced to try them for this figure since my usual vendors were all sold out of Smart Robin. ToyArena is a good store. I don’t use them as much since they are based in CA, which means I gotta pay sales tax. But I’ll keep them in mind for the future as a backup store. 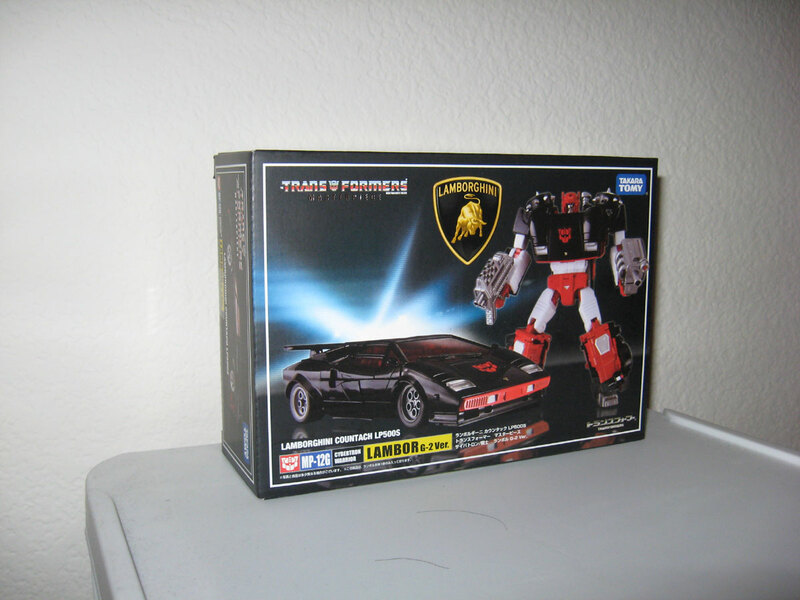 Last but not least is the Masterpiece G2 Sideswipe (or Lambor in Japan). This a Takara import figure, and a US release is not likely. I have done reviews of both Sideswipe and Red Alert so I won’t go too deep into it. Imagine taking G1 Sideswipe and reversing the colors of black and red where they are, and you have G2 Sidewipe. Fr MP G2 Sideswipe, Takara gave him a new face mold, 2 different looking guns, some spiked wheels for the shoulder attachment, and a nice looking sword. For the decals, you have the option of using the G1 or G2 Autobot insignia. Very cool! I still have my original G2 Sideswipe from back in the 90s. Maybe someday I’ll put these 2 figs side by side for a past and present shot. All 3 figures appear for display in this post. Here we are again! Five years ago this day, I started this blog. On the last anniversary post, I mentioned some “tentative future plans”. What I was referring to was moving off of WordPress and into a self-hosted blog. If you are looking at this now, then you see the fruit of that effort. The transition took longer than I thought it would, but better late than never. I registered the domain in January 2014, but did not cut over the content til July. The stats appear below. The first pic is total hits up til the conversion, and the 2nd pic shows the hits on TF Matrix since. The big spike in hits in June 2014 is due to Age of Extinction. Adding up the hits in July from the 2 graphs, the number is pretty close to June’s. As always, anytime a Michael Bay movie is out in the theaters, this blog soars in activity. It does appear that after the transfer to the self-hosted blog, the hits are going down. I think this is just things returning to normal, after the movie. Total hits of this blog is 407,722. As of the 4 year anniversary, total hits were 283,018. That means in a year’s time, my blog got about 120,000 hits. Not bad. Traffic seems to be increasing every year, which is always a good sign. As long as there are fans reading, I will keep blogging. TFs will never go extinct! The evolution continues… and fans will forever heed this call… Transform and Roll Out!